Although the world over governments are saying loudly all the new laws and initiatives on “Fake News” are designed for the “good and safety” of the people we see in practice again and again that it is more about the government controlling the narrative and is essentially for the good of the government itself as they do not like the spotlight this modern information world puts them under. In an environment where the people have access to facts, figures and varied opinions the people get to decide for themselves what and who to believe and what is in their best interest and governments do not like that, especially ones who have been selective with the facts and used to telling everyone what to do and being followed obediently. There are 2 simple answers to the phenomena of ‘Fake News” and neither is to do with adding new laws and rules and shutting down voices. The first, and most important in my mind, is for governments to win back the trust of the people. This is NOT done by staying silent on inconvenient matters or giving less or misleading information in the hope it will go away, it is NOT done by not giving people the full picture, it is NOT done by denying people access to alternative viewpoints and it is NOT done by avoiding responsibility and “spinning” the facts to suit an agenda instead of addressing what is of concern. It is done by the government being OPEN, HONEST and TRANSPARENT in its activities. By plainly speaking about the pros and cons of the choices available and why it is making the decisions it is making. By clarifying all the implications of the paths it has chosen and, when a choice negatively impacts someone or segment of society, enunciating a valid argument of while in the short term it may be less than desirable it is worth the sacrifice for the long-term benefit… And as this is often the case governments have to HONOR the long term promises and not keep failing to keep them or giving excuses or shirking responsibilities when it does not work out as intended. The second part is public education on critical thinking, information and source evaluation and providing access to the data and facts for them to decide for themselves. The first part of this equation the people are already pretty good at on their own but could do with some help to improve but the second part is almost solely the responsibility of the government and while governments continue to “hide” important details people will follow and believe what they “imagine” to be correct in their absence. When you inherently TRUST someone, you will be slow to believe anything said against them and when you do not the reverse is true. So, the government focus should not be on shutting off alternative access and forcing the people to listen to only their side but on building trust so the people will confidently follow them. Every action the government takes to clamp down on ‘Fake News’ just damages what little trust is left and certainly does nothing to enhance it. 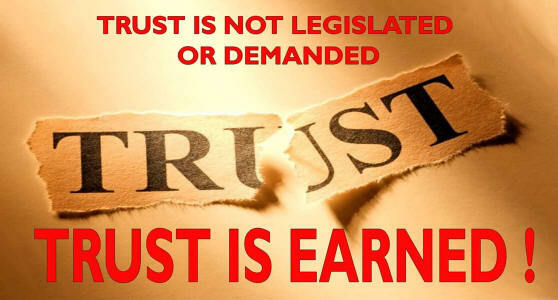 You can’t demand trust you must EARN TRUST. When will they wake up to this simple fact? PAPpypolitics WALKING UNDER THE MOONLIGHT is fearful of their own shadows. How to trust them like that? Hey angmor tuakee, the people already have absolute trust in our govt. This trust is not just given like that, it was built up over the decades as our govt gave us everything from good jobs, good education, good public housing, good transport, good healthcare and more. Go familiarize yourself about how terrorism and cyber-terrorism is so big problem. Don’t be ignorant. If there is no control over the fake news, we will be in big trouble. Don’t try to impose your western values on us again. We are Asians. If there is problem or disagreement with our govt, we will work together with our govt in consensus. Don’t try to create any rift between the govt and the people. QUESTION:What is the FAKEST NEWS IN SIN CITY N WHO LOVES UTTERRING IT? Even my 5 year old niece knows the correct answer. *FTs will create more jobs for sgs* from Lee Ah Long who says it with a GRIN! The problem is not the PAP trying to win back trust, the problem is that the PAP die die wants to continue doing things their own way and when things go wrong say it’s always never their fault. All these mishaps we have seen in the last few years (failed AGO audits, SAF deaths, Singhealth hacking and HIV info spread on the dark web) have certainly dented the faith and trust in the government for sure. And the issue with the PAP is their ARROGANCE. Their arrogance gives them the impression that they can do no wrong and nothing is ever their fault. You can see they aren’t even trying to win our trust back with all the increases in the price of water, transport hikes and so on. Right now they don’t have to worry about public feedback because they have the supermajority in parliament. If this year’s elections does not go the way they expect then you can expect PAP to wake the F up overnight. So please don’t expect the PAP to suddenly want to earn your trust, it just will not happen. It’s easier to just vote out as many of their monkeys as possible, we certainly do not need an uncaring government who does not look after us to even want to win our trust back. It is the case of the government can not earn any trust, by having the “Fake News” laws, it can at least stop anyone from telling others you cannot trust the government. GRC was supposed to ensure minority race to be voted into Parliament, but it turns out that the Chinese majority who’s the ones using GRC to enter Parliament. Whereas an Indian was voted into Parliament by himself, without any help from the Chinese. Government wants minority races to be voted into Parliament, but we were told minority representation was only during the election and not necessary after election. So MPs can absent from Parliament or sleep in Parliament sessions. Government needed to change the constitution for a Malay to be President. So desperate to equate 4 to 5 just so that an Indian was selected to be a Malay President. So can you continue to trust the PAP? In order to force the people to trust the PAP, it is necessary to have “Fake News” laws! After passing this laws, the above could not be mentioned again. pap knows it doesn’t work this way in sg – the land of the daft. Though many voters have already lost trust in our G, they also do not trust the untested oppositions, so pap will still get the daft’s votes. Thus, our G doesn’t have to worry about having to earn it. They just take it for granted. Yes and somehow with very good timing, the word “Indian” was removed from Wikipedia. I suggest that it is less a matter of not trusting the government and more a matter of skepticism and uneasiness about the expansion of the power and reach of politics at the expense of individual freedom. When Government is not safeguarding the pillars of freedom, namely: free speech. Trust, in the government has been lost, across the board. This deep seated mistrust is perpetuated by the utilization of archetypal class warfare tactics. This ‘divide and rule’ strategy works very well to keep the privileged in power at the expense of everyone else. Our nation as a whole is no longer inspired by the pursuit of worthy ideals. A mentality of we’ve been had prevails and we won’t let it happen to us again. We don’t have time to read the fine print but we know it’s there. Even if it seems like a good deal now, it will get us in the future. The basic difference is that I am no Hyflux investor. who is master of fake news in Spore? who lies publicly in Spore? INDIAN is malay. inside 200m is not within 200m. HDB is asset that can be enhanced. aliens FTs PRs create jobs for local born. cannot eat degree. car lite. not ready for INDIAN malay prime minister. the list of pap lies is very long. the problem does not lie with pap lies. the problem lies with poorly educated Sporeans who remain sheep. You are asking PAP to be open, honest and transparent, you are asking it to change the DNA that it is founded upon; manipulative, greedy and evil. It will not happen. It will not be able to change itself, the traits will reinforced themselves, likes recruiting the likes. The change needs to be surgical rather than incremental. Five decades in power uninterrupted have resulted in complacency and arrogance. The corresponding decline will be steep and rapid. We need a new team and a new government urgently. We have heard of a Job hopper, Church hopper and now Political party hopper. Perhaps Brad can enlighten us why he has moved from PAP to NSP to PVP and what’s next? Is it you who is the problem or the party that you were previously associated with? Are you hypersensitive to the extend that anything which you disagree with is deemed as a personal attack on you? To allay our apprehensiveness, you could give us valid reasons then we will enjoy and look forward to reading your articles. From Swiss living standard, CPF and now HDB, just to name only a few over the decades. You are just those few who had grown thinker skins over the years and have very high pain tolerance. With millionaire stooges running the country, high living cost but third world living standard, stolen CPF and zero value HDB, the pain is yet not high enough to evaporate your trust but just uneasiness?? Firstly, your Leeder said “Singapore belongs to everyone” so please shut up or you are disrespectful to your master. Secondly, ordinary people got eyes to see “good jobs” means Grab driver or work under hoards of foreigners. Ordinary people got ears to hear that “good education” has different meaning for the elites and the ordinary SGrean. Ordinary people got skin to sense the meaning of “good transport”, everyday ! Ordinary people got brain to know that “good public housing” is just a way to deplete their hard earn money and leaving nothing for their children. Ordinary people know more than you think. Thirdly, we are Asian but parliamentary system is a concept founded upon western values. So abolish election ? Only those who ARE “GUILTY” of “abuses”…would go to the extend of “finding excuses” to “implement” this LAW !!!…PERIOD ! No need to “wayang” and “talk and talk” ! It is because of such “rulers”…that is why we find the “existence” of “resistance” as well as …even “terrorism” ! Are you going to be “threaten” by them still ???? GOD says…DO NOT FEAR ! I think you’re suffering from myopia. Hopes that explains your “loose cannon” diatribe. Haigen-Diaz: When Government is not safeguarding the pillars of freedom, namely: free speech. Trust, in the government has been lost, across the board. Another Educated Daft: You are just those few who had grown thinker skins over the years and have very high pain tolerance. With millionaire stooges running the country, high living cost but third world living standard, stolen CPF and zero value HDB, the pain is yet not high enough to evaporate your trust but just uneasiness?? Wonder why this brad bowyer guy turned from pap to opposition. Is he for real?